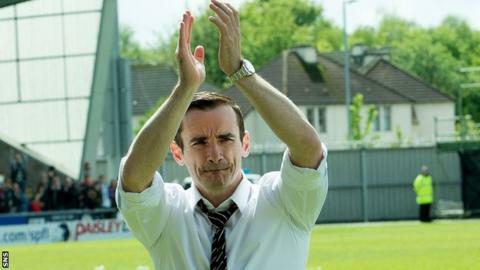 St Mirren manager Danny Lennon thanked the club's fans and board of directors as uncertainty over his future looms. The Buddies finished their season with a draw against Hearts and Lennon's contract is due to expire in the coming weeks. "The board of directors, I'm led to believe, will meet again on Monday and we'll take it from there," said Lennon. "I would love the opportunity to build upon the foundations we have built here." Former Raith Rovers and Hibernian player Lennon joined St Mirren following his first managerial spell at Cowdenbeath. Last season, the Paisley side won the Scottish League Cup but they struggled for large periods this term. "It's something the players can be proud of," Lennon told BBC Radio Scotland. "Throughout the course of the season we've all had our characters judged. We've all got professional pride and the way the boys have bounced back from positions that we've been in this season, to finish in that position, is something we can be proud of. "I would just like to thank the wonderful fans here that I've had over the four years, they've been absolutely terrific. "The amount of letters and personal emails I've received from them has been very moving. We've created some fantastic memories together. "I've got to thank the board of directors over that four years for their continued support. "I can't get inside a board of directors' heads and see where they are. The most important thing is they'll make what they feel is the best decision for St Mirren Football Club and the supporters. "Over the four years that we've had, they've had the best four years that they've had for a generation. "I've had a wonderful time at this football club. My family have been absolutely terrific. I've got good people that have helped me ride that rollercoaster." And Lennon emphasised his record of successfully bringing players like John McGinn and Kenny McLean into the first team. "This season, we've now brought seven players through the academy," he added. "Five of them have played regularly, week in and week out. That is fantastic. "When you're bringing kids through like that, results suffer every now and again while they're going through that learning curve."